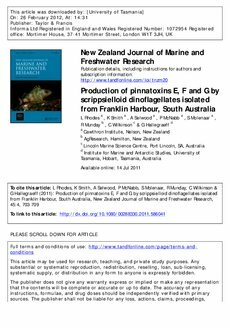 A pinnatoxin producing dinoflagellate was isolated in cyst form from sediments from Franklin Harbour, South Australia, December 2009. One isolate (CAWD180) produced pinnatoxin G, E, F and A (87, 10, 41 and 1.3 pg/cell respectively; liquid chromatographmass spectrometer, LCMS, analysis) and another (CAWD183) produced pinnatoxin G only (13 pg/cell). Australian strains were identical to pinnatoxin E and F producers isolated from Northland, New Zealand (2008), based on large subunit (LSU) rDNA and ITS spacer region sequence data. Cysts were capable of division and produced more toxin per cell than the excysted motile form. Crude extracts of mass cultures were tested for toxicity in mice by intraperitoneal (i.p.) injection, gavage and voluntary consumption, and toxicity ratios were 1.0:1.8:4.5 (CAWD180) and 1.0:2.9:7.8 (CAWD183). This is similar to the ratios for New Zealand isolates, but differs from other cyclic imines for which oral toxicity can be 101000-fold less than i.p. administration.